The Series 2500H heavy-duty skid design and construction have been engineered and crafted to provide years of productive operation, and can be field maintained with ease — all steel construction provides superior strength, durability and reduced maintenance costs compared to cast iron and aluminum pumps. These self-powered, double-acting pumps are an ideal solution for applications requiring high volume, continuous pressure pumping of grouts, cement slurries or epoxies. Driven by a reliable 20 HP electro-hydraulic power plant, the opposing twin cylinders provide a smooth even flow of material at consistent pressure. 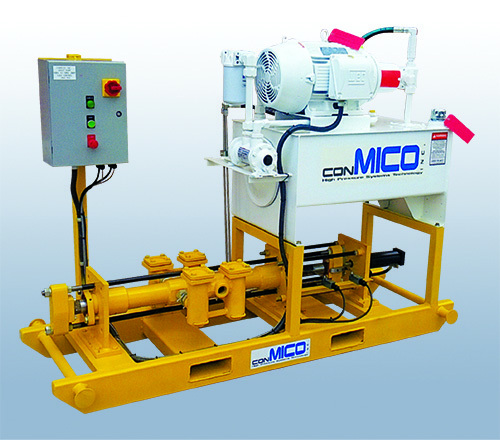 This unit features a ConMICO exclusive — a self-contained, pilot driven manifold system that drives the reciprocating double acting pump cylinders. The completely sealed control system is protected against failure from cement spillage and accidental impact. The twin valve chambers feature quick change Super Stako fittings for ease of cleaning and seat replacement. This unit is available in either stand-alone systems or incorporated into a dedicated grouting plant.